This morning thousands -- perhaps hundreds of thousands -- of people worldwide drank water free of arsenic thanks to the scientific contributions of Professor K.J. Reddy in the College of Agriculture and Natural Resources at the University of Wyoming. His arsenic cleansing innovation is only one of the advances of global importance that led to Reddy being honored with the Outstanding Research Award from the Wyoming Agricultural Experiment Station (AES) last week. The arsenic-cleaning process developed several years ago was an offshoot of research into removing selenium from water by Reddy in the Department of Renewable Resources. In the mid-1980s, he proposed the use of carbon dioxide to accelerate the mineral carbonization process that lead to the development of a mineral carbonation research program at the global level. Reddy received the award from Bret Hess, director of AES and associate dean of research for the college. "It's a wonderful gratitude to be recognized by your peers," Reddy says. "I appreciate all the contributions made by my previous and current graduate students and the support from my colleagues." Hess said Reddy's world-renowned research contributes to the discovery mission of the college. "Reddy researches issues relevant to Wyoming, and several of the resulting discoveries have lead to technology that is transferred throughout the world," Hess says. "It was a pleasure to recognize Dr. Reddy for his exemplary research work." Reddy joined UW in 1986 as a post-doctoral researcher and then was a research scientist in the UW Water Research Center. He joined the Department of Renewable Resources in 2000 as an assistant professor and was promoted to full professor in 2005. Reddy has developed innovative teaching, research and outreach programs focused on energy, natural resources and the environment. His research has attracted more than $32 million in funding from state, federal and industrial sources and has written or co-authored more than 310 technical publications and delivered 300 professional presentations. 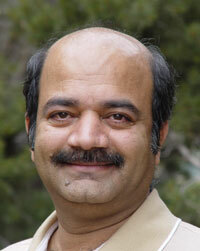 Reddy also served as the associate director for the UW School of Energy Resources from 2008-2010. Reddy's research topics include mineralization of anthropogenic carbon dioxide, filtration of toxic arsenic from water, geochemistry and water quality of coal bed natural gas-produced water, removal of nitrate from groundwater and speciation of toxic selenium in water. John Tanaka, professor and head of the Department of Renewable Resources, nominated Reddy for the award and complimented Reddy on his research, academics, service to the university and his cooperation among colleagues. "His professional and personal collegiality with colleagues, staff and students make him a role model for many," stated Tanaka. "In the short time I have known and worked with him, I am continually impressed with how he interacts with everyone. He does not let ego or stature influence those interactions, other than his desire to see the best in everyone and to encourage those around him to work to their full potential."